BAKU, December 24. /TASS/. 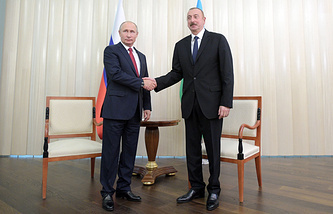 The upcoming year will see a surge in economic cooperation between Moscow and Baku, Russian Ambassador to Azerbaijan, Mikhail Bocharnikov, told a press conference in the Azerbaijani capital on Monday. "Next year, the priority will be to fulfil the agreements reached this year, primarily those regarding the development of economic ties. We have adopted essential documents: a program on bilateral cooperation in the economic area until 2024 and an action plan for economic cooperation consisting of five roadmaps for the same period. In general, our economic collaboration will deepen in 2019," the ambassador vowed. He stressed that the Russian side expects that the reached agreements will be given specific content. According to Bocharnikov, "there are significant plans to foster humanitarian cooperation." "The pinnacle and boon to our relations, as it was in previous years, will be political ties and high-level contacts," the diplomat added. Data from the Federal Customs Committee of Azerbaijan has shown that the trade turnover between both countries amounted to $2.26 bln over the first 11 months in 2018, which is 19.7% more than it was for the same period in 2017.